Our Molly I was told when we got her was to be a Jack Russell. She looks a lot like your dog. The only exception is her head is brindle with a white stripe running down the middle of her face. She is the sweetest dog ever and can be protective. She had pups with our Staffordshire Terrier. One pup owner had DNA test. 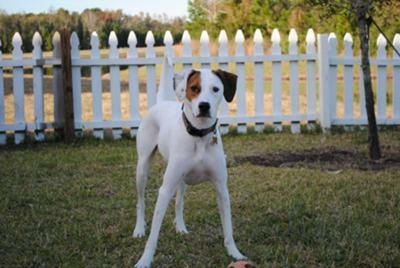 The reading shocked us, we were determined that Molly was a Pointer mix but the test results reviled a Jack Russell! It is part Beagle, Beagles can be short yet I have seen pretty tall Beagles. Just like your dog. My daughter adopted a potcake dog that is the splitting image of your pup. The type's name is derived from the term "potcake", which refers to the congealed rice mixture at the bottom of the family cooking pot that Bahamians have traditionally fed dogs. my dog looks just the same!!! my dog comes from mauritius (yeap the african island) and he looks just the same. Same white fur, same brownish spot on the eye, same kinda curly-strait tail! When people ask my what species he is: I just laugh and say he's a ''giant jack from Africa''. It kind of puzzles them.